Home / Blog / What is the Norwood Scale in hair transplant? What is the Norwood Scale in hair transplant? Male pattern hair loss, sometimes seen at younger ages and sometimes at older ages, is the most common type of hair loss among men. Early diagnosis is very important in hair loss as well as in every health problem. Published by Dr. O’Tar Norwood in 1975, the Norwood Scale is the most widely used classification for hair loss in men. The Norwood Scale, specially developed for men and classified in different types of hair loss, still maintains its validity today. The Norwood Scale has a total of 12 different shedding types, with grading levels ranging from 1 to 7. Norwood Scale gives an idea of what treatment should be applied for hair loss as well as determining the level of hair loss. If the falling out of your hair has progressed, it might be difficult to obtain your fallen-out hair by medication. In such cases, people are recommended to have hair transplant. If your hair loss problem is still at the beginning, that’s good news for you! Type 1: It is a regular hair loss. It is seen at younger ages after adolescence. Type 2: It is more common in adults and at older ages. Type 2 – A: Hair loss starts on frontal hairline. 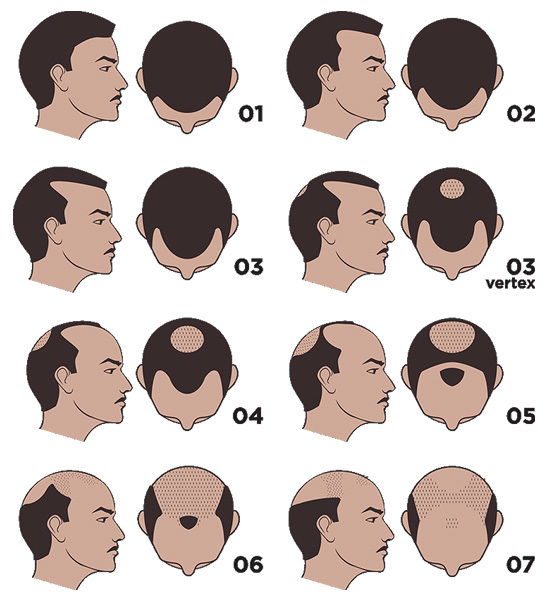 Type 3: It is the earliest phase of male pattern hair loss. Type 3 – A: Loss of frontal hair. Type 4: The hair on top area start to fall out. Type 4 – A: Hair loss is seen over all the forehead skin. Type 5: It is a hair loss which mostly occurs in the front part (forehead). However, hair on top areas also start to fall out. There is a distinct hair mass between the front and top of head. Type 5 – A: Hair loss in front and middle of scalp. Type 6: Falling out is accelerated in the front and top areas and thinning occurs in the area we can call as bridge. Type 7: Bridge between front and top areas disappears. Hair has fallen out to a large extent. Type 8: Most of the hair in front and top areas are fallen out. Image of the existing hair looks like a wreath.